Though we still have quite a bit of snow around, yesterday's rain compacted quite a bit of it so my sister and I decided to go ahead and attempt a hike we had scheduled for today. Our day started out great. All three boys joined me in bed this morning for a bit of cuddling and giggling. The older two boys played words with friends on my kindle as we talked about our plans for the day. The boys grumbled a bit as we were getting ready this morning but they always do and then have so much fun once we get there and actually start hiking. I ignored the grumbling, knowing we all needed some fresh air and exercise. We bundled up with boots, ski pants, and all our winter gear. As the sun was shining brightly today I was actually excited. I don't think we've ever ventured into the snow covered woods and I thought this would be a great adventure for us all. The park we had planned to meet at was not plowed so we met up down the street instead. 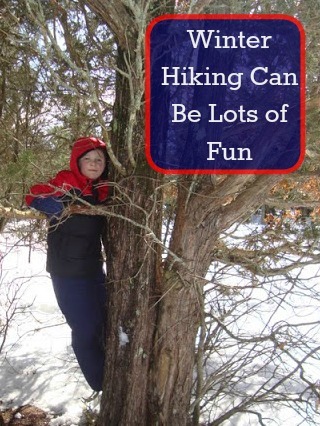 We played, had snowball fights, climbed trees and all that other fun outdoorsy stuff. It was a great day. The weather was pretty warm and mostly sunny-- it was wonderful and the kids all had so much fun. We played for almost 3 hours and they were drenched from head to toe as they spent more time on the ground than on their feet. Even with waterproof gear we could only keep so much of the water at bay. They found "big foot" tracks (really snowshoe tracks but they pretended they were hunting Bigfoot! ), we found "bear tracks" (Evan insisted the prints were from a baby bear but the older boys thought dog, or wolf perhaps). They jumped off picnic tables into the snow pretending to jump off a diving board into the water. They used to sticks to catapult snow at one another pretending they were magic wands sending spells flying. They realized that the sticks would throw the snow further than their arms but you had to get the snow on just right; if you packed the snow too tightly it wouldn't fly through the air, but if you didn't pack it tight enough then the snow fell off. They made snow angels, burrowed under trees as caves or forts. Threw snowballs almost constantly (which caused some tears here and there) but ultimately had a great time enjoying a whole lot of fresh air. Animal tracks leading into the woods-- very exciting! so the boys settled for throwing snow at it. Table jumping with a twist! Now that's a big snowball! Alec practices Ninja moves; "throw a big snowball in the air and try to punch it"
More animal tracks... see the claw marks? We live on a lake so we know all about unsafe ice! My boys have been trained to stay off the ice until it's been checked and cleared by an adult. In this case it was more of a not knowing where the ice/water began and where the shore ended. I do have to work much harder to make myself get outside in winter; I'd love to just hibernate but I know I feel better after I've gotten out of the house. This was one of those days where the sun kept the air from feeling cold and there was no wind. We mostly just had to focus on staying dry. Looks like you had a fantastic day. I love getting out at any time of year but the snow just adds an extra element of magic and mystery doesn’t it? And exercise too! After walking through deep snow most of the day I was amazed at the burn in my legs and the calories my counter said I had consumed.